It first flew on Friday, 26 June 1953 at Weybridge, Surrey, England powered by Rolls-Royce Dart 505 engines. Withdrawn from service by Northeast Airlines (UK) at Woolsington Airport, Newcastle, England in 1973 and used for cabin crew training. Preserved at Lampton Pleasure Park from April 1977 and at Saltwell Park from 1982. Broken up for scrap in March 1993. Discussions concluded between Vickers-Armstrongs (Aircraft) Ltd and British European Airways Corporation (BEA) regarding the specification for the V.701 aircraft. Accommodation for 47 passengers at a gross weight of 53,000 lbs was specified with Rolls-Royce Dart RDa3 Mark 505 engines. Order placed by British European Airways Corporation (BEA) for 20 V.701 aircraft which was later increased to 26. This was the 9th V.701 Viscount ordered by British European Airways Corporation (BEA). and the 11th Viscount assembled at Weybridge, Surrey, England. Production Order No. F09/701. Sales Order No. 09/84A. Stock Order No. 14/10B. Fuselage assembly commenced at Weybridge Airfield, Surrey, England. Registration to Vickers-Armstrongs (Aircraft) Ltd cancelled. Re-registered to British European Airways Corporation (BEA). Delivered to British European Airways (BEA) named as 'R M A Sir Edward Parry'. It was fitted with Rolls-Royce Dart RDa3 Mark 505 engines. The cabin was fitted out with a 47 seat all-tourist class layout. The original ‘cutlass’ design propeller blades were gradually replaced by new symmetrical ‘paddle’ blade propeller sets. From photographic evidence, both propeller types were fitted to Rolls-Royce Dart RDa3 Mark 505 and Mark 506 engines and many V.701 aircraft flew with an ‘intermix’ of both types of propeller blades. All BEA V.701 aircraft were gradually retrofitted with Rolls-Royce Dart RDa3 Mark 506 engines which were upgraded using modified Mark 505 engines. Aircraft are known to have flown with an ‘intermix’ of both engine marks between these dates. When completely retro-fitted with Mark 506 engines, the V.701A designation was applied to these aircraft although this has not been seen widely used or quoted. Noted at Blackbushe Airport, Hampshire, England after a London Airport weather diversion. The passengers were transferred to London by coach. To Wisley Airfield, Surrey, England for flap modifications. Operated the first Viscount service from Gibraltar to Tangier, Morocco, which was operated on behalf of Gibraltar Airways, flown by Captain J Cooper. Purchased from British European Airways (BEA) and registered to Channel Airways. Delivered from London Airport (later known as Heathrow), Middlesex, England to Southend Airport, Rochford, Essex, England. Leased to British Eagle International Airlines Ltd in their livery. Leased from Channel Airways and delivered to London Airport (later known as Heathrow), Middlesex, England in full livery named as 'City of Manchester'. Sub-leased from British Eagle International Airlines Ltd. Operated in British Eagle livery with Starways titles still named as 'City of Manchester'. Returned from British Eagle International Airlines Ltd lease. Registration to Channel Airways cancelled. Delivered from BKS Air Transport Ltd at Speke Airport, Liverpool, England to Teversham Airport, Cambridge, England for overhaul by Marshalls and the fitting of integral front 'airsteps'. Delivered from Teversham Airport, Cambridge, England to Rhoose Airport, Cardiff, Wales via Southend Airport, Rochford, Essex, England. Involved in a ground collision with the terminal building (Gate 2) at Speke Airport, Liverpool, England. The date is often reported as 15 July 1967 which is incorrect. The aircraft had been having hydraulic problems and had supposedly been ‘fixed’. It was being ground tested by two engineers when the hydraulics failed again, resulting in a loss of nosewheel steering and brakes. The aircraft clipped Aer Lingus Viscount EI-AKO (C/N 421) before slamming into the terminal building having already demolished two sets of British Eagle passenger steps and a baggage trolley. The nose undercarriage leg was pushed backwards and both starboard propellers were curled, resulting in shockload damage to the Rolls-Royce Dart engines. The starboard upper fuselage behind the cockpit and one cabin window were punctured by flying debris. Painted in the Cambrian Airways 'BAS - British Air Services' livery. Painted in the Cambrian Airways 'Blue Tail' livery. 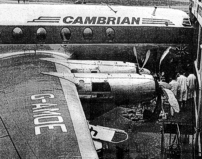 Transferred from Cambrian Airways and withdrawn from service at Woolsington Airport, Newcastle, England. Total time 28,803 hours and 24,429 total landings. Fuselage and stub wings but minus the tail noted painted up in Northeast livery and being used as a cabin trainer. Registration cancelled as aircraft permanently withdrawn from service. Asset transferred to British Airways (BA) due to a corporate merger. Asset transferred from Northeast Airlines due to a corporate merger and continued to be used as a cabin trainer painted up in BA livery. Rear fuselage and tail section from Viscount G-AOHJ (C/N 159) transferred to this forward fuselage. Sold to Lambton Pleasure Park. Remains purchased from British Airways (BA). Northeast Airlines had merged into British Airways (BA) in 1974. Put on display in the grounds of Lambton Castle, Chester-le-Street, County Durham, England. Painted up with 'Lambton Airways' titles and fictitious registration G-WHIZ minus wings and using the tail section from Viscount c/n 159 G-AOHJ. This fictitious registration was also applied to C/N 75. Fuselage moved to Saltwell Park, Gateshead, Tyne & Wear, England. Fuselage moved from Lambton Pleasure Park, Lambton Castle, Chester-le-Street, County Durham, England and marked up as 'Saltwell Airways'.